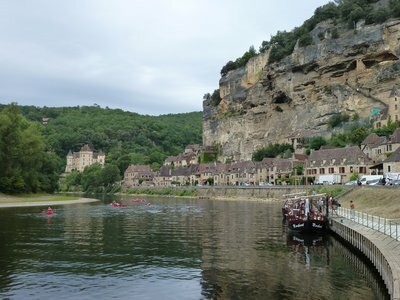 Dordogne - Canoe Trip, Castelnaud, Sarlat, and More! 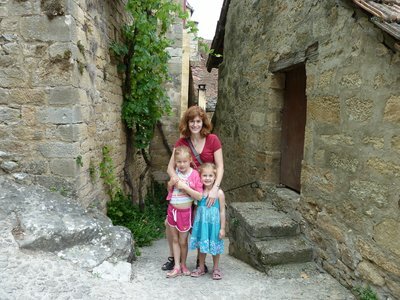 July 7, 2011 - First full day in Dordogne. 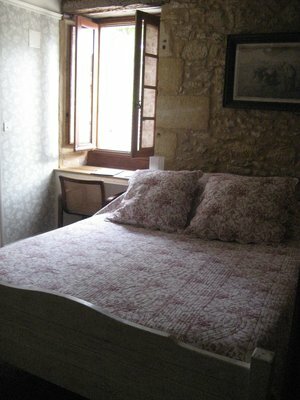 We are lucky to be staying at a beautiful Chambres d'hotes called Le Chevrefeuille. 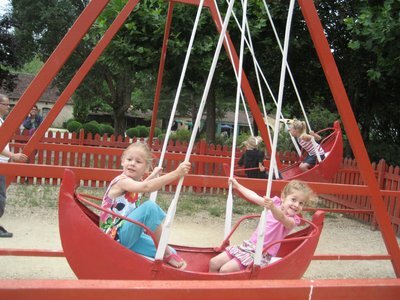 The grounds are big with play equipment, gardens, a pool (a huge hit with the kids), and plenty of picnic areas. There's a playroom and communal kitchen area. Our room has two exposed rock walls and bunk-beds. The girls alternate who stays on top each night! The morning breakfast is great too. They have pretty much everything you could want - including mini boxes of sugary cereal for the kids. They love it! 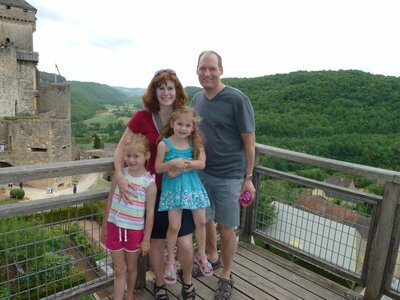 Our first outing was to the small village of La Roque-Gageac. It's nick-named "the rock" because the town clings to a rock cliff. We walked up some narrow passageways up to a church that overlooked the river. 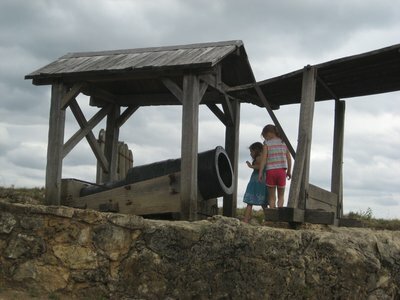 We were amazed by just how old everything seemed. 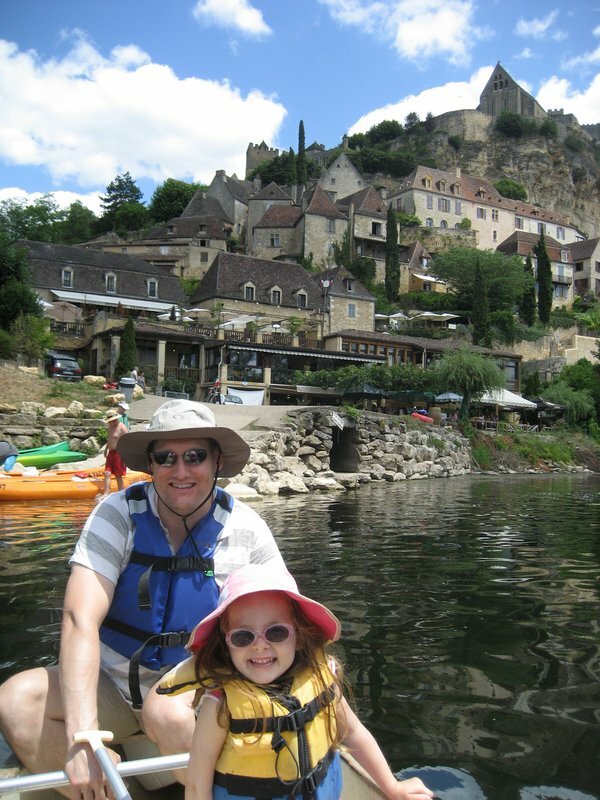 Apparently the Dordogne River floods the town every year. 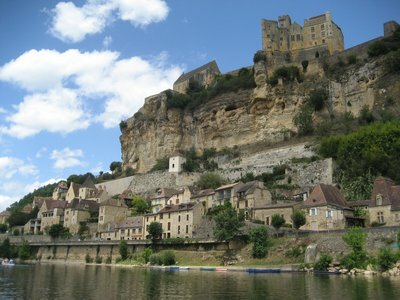 Next we moved downstream to Castelnaud - an imposing fortress castle guarding over the river. We had a small picnic before heading into the castle. 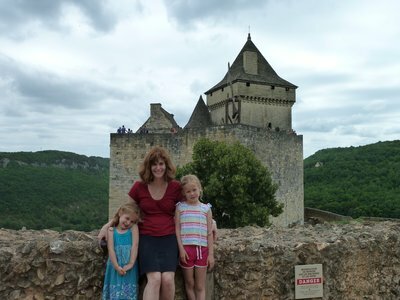 This castle was especially fun because we could enjoy it at our own pace. 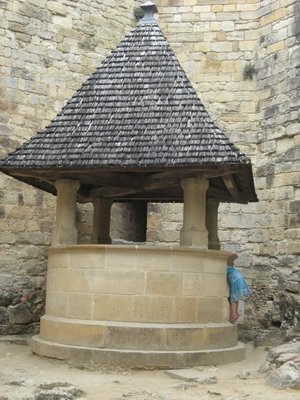 We rambled up and down narrow staircases and the girls tossed small pebbles into a very deep well. What a difference from King Ludwig's castles in Bavaria! 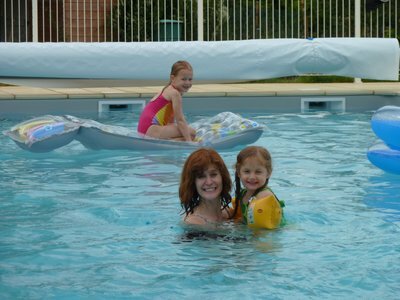 By now, the girls were aching to get into the pool. We went back and spent time swimming. 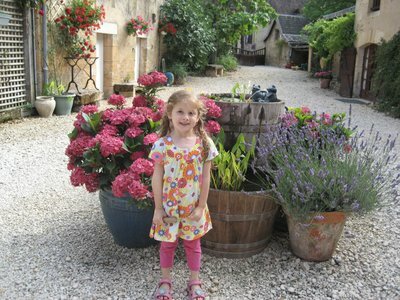 We were lucky to meet other friendly English-speaking people at our b&b. 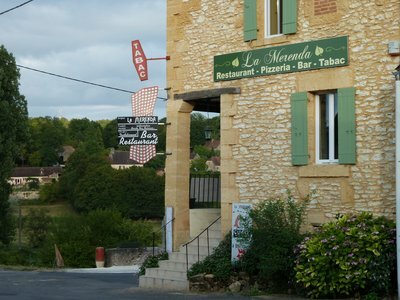 They directed us to a town nearby, Meyrals, for dinner. What a great find! 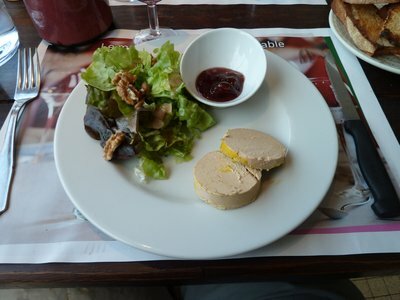 We were able to try foie gras and canard confit (duck in its own fat) - both regional specialties. 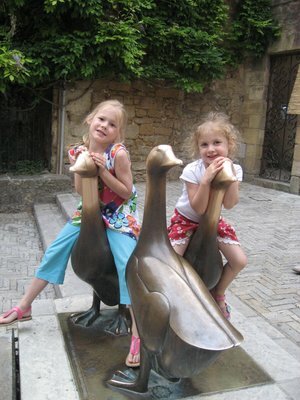 Foie gras is a huge deal around here and we've seen it for sale EVERYWHERE. I think it's an acquired taste. We liked it but didn't love it. Sorry all you foodies reading this! The duck, on the other hand, was tasty. 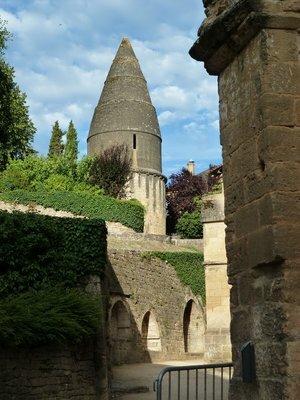 A few notes about the Dordogne region. The roads are incredibly narrow and windy. Some people drive SO fast on them despite barely having enough room for two lanes. I haven't dared drive and have to keep a keen eye on the road so I don't get car-sick. There are a lot of English-speaking people in the region which is nice. 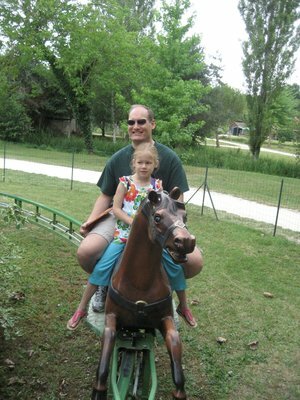 The region feels relaxed and slow-paced. My to-do list was pretty big upon arrival but I've already limited the number of activities. We've been travelling for nearly 3 weeks now and need more down-time. This is the perfect place to accomplish that task! 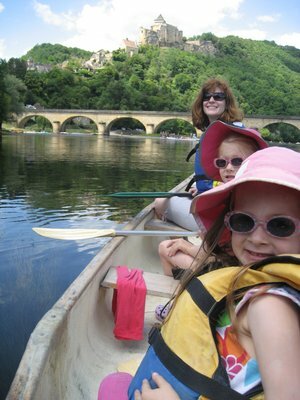 July 8, 2011 - Dordogne river canoe trip! We started our day with another nice breakfast. 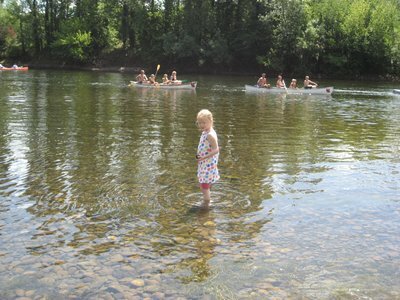 We made arrangements to take a 4-person canoe down a scenic stretch of the river. The river is very calm and requires quite a bit of rowing. I guess that explains my blister! The views were great and we couldn't have had better weather. 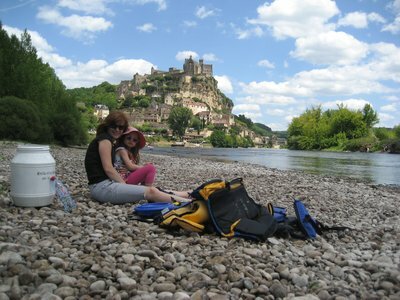 We stopped a couple of times for snacks and to relax on the rocky banks. DD#2 was especially in the zone and loved watching for leaves and water plants. 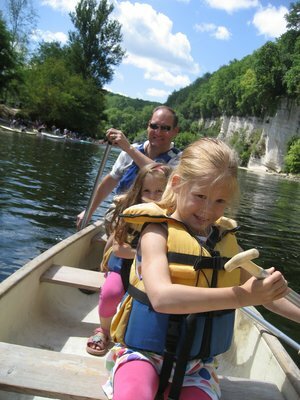 Canoeing the Dordogne is quite an operation. There are many competing companies and hundreds of people partake everyday. It was still relaxing despite the river traffic. After the 3+ hour canoe trip, we came back for more swimming and snacks. The French eat dinner very late. Many restaurants do not open until 7pm. We decided to eat at the same place we'd been the night before because it was nearby, delicious, and reasonable. We opted for easy pizza and beer. Another nice day that just flew by. 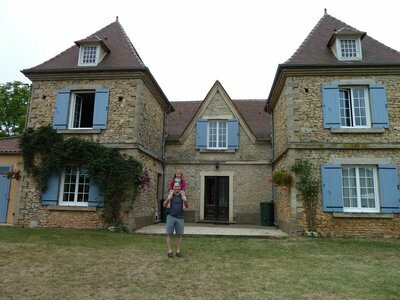 After a leisurely breakfast (lots of friendly English-speaking folks here including a family from California), we headed off to a farmer's market in Le Bugue - another little village up the road. 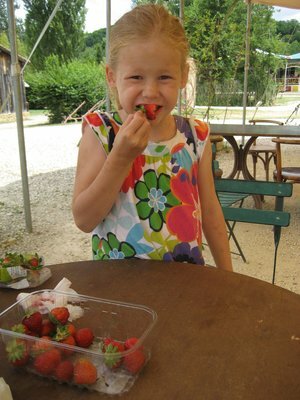 We bought local strawberries and a roasted chicken for lunch. I also found some fun duck-themed souvenirs. 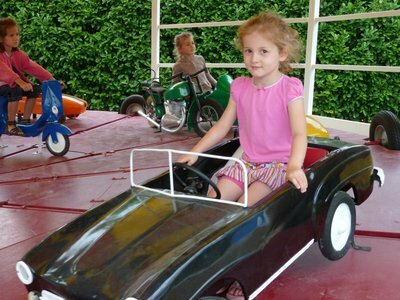 We then headed to a funny little village/amusement park called Le Bournat. 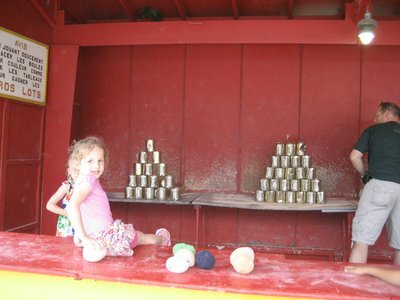 It's supposed to be a replica of a 1900s village complete with artisans and kid-themed rides/attractions. It was a little hokey and the kids were only interested in the rides. Still, it was a nice place to have our picnic and spend a few hours. As always, we headed back for our afternoon swim. DD#2 took a much-needed nap after an explosive tantrum. So fun. 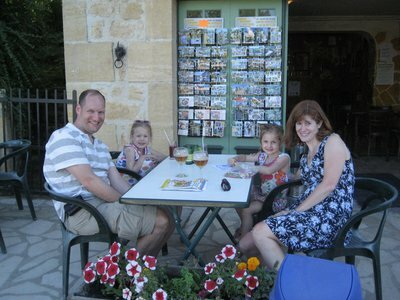 Travelling with our lovely children 24/7 can be very challenging at times. I know we're privileged to have this opportunity but everyone sure has their less than stellar moments. 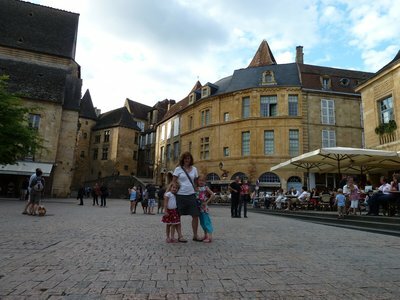 After everyone seemed back to normal, we headed to Sarlat - the largest and most well-known town in the area. 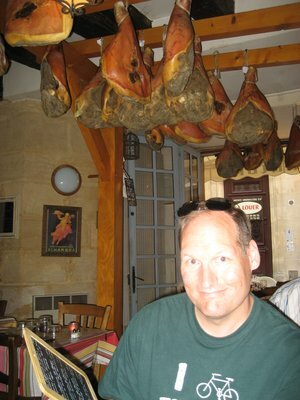 We found a restaurant that had hams hanging from the ceiling and had a yummy - and very cheesy - meal. The best part was wandering the lovely little pedestrian-only streets after dinner. 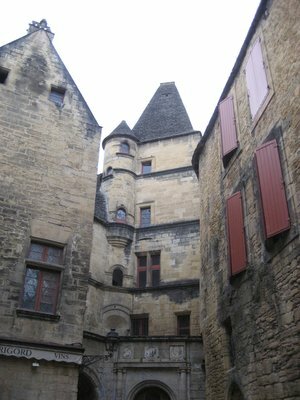 There were many secret passageways to explore and rocky old architecture. The stone roofs were incredible. I especially enjoyed our evening stroll around this town. It's after midnight now and I apologize for any misspellings. Time for much-needed sleep!